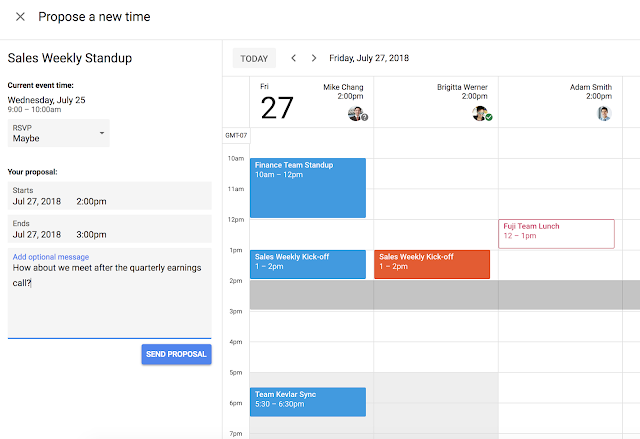 Rescheduling in Google Calendar just got easier. We’re introducing a new feature that enables more efficient meeting scheduling. Now, each guest invited to a meeting can propose a new time and the organizer can easily review and accept time proposals. This allows for richer communication between attendees, reduces time spent on meeting practicalities, and makes meetings more productive with key stakeholders in attendance. When a user is invited to a Calendar event, they can respond “Yes,” “No,” Maybe,” and now, “Propose a new time.” If calendar access permissions have been granted, guests can see the other attendees' availability side by side, so they can suggest a time that works for everyone. Guests can then send their time proposal along with an optional message to the organizer, who can accept the proposed time with just one click. This functionality works across domains and with Microsoft Exchange. Guests can send proposals to organizers using Exchange, and organizers can receive proposals from guests using Exchange. Available on the web now, this is coming to mobile on August 13th, so your users can act while on the go.